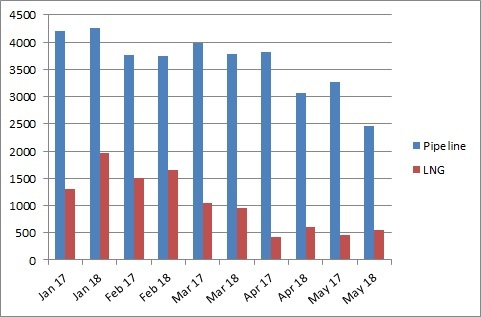 Turkey’s gas imports during May were down by 19% year on year, from 3.72bn m³ to just over 3bn m³, due mostly to a decline in demand from power generators on the back of increased coal-firing. The power sector, which had 32% share in the total demand, reduced its gas usage by about 18% to 1.67bn m3 in May, according to statistics from Turkey’s Energy Market Regulatory Authority (EPDK). Electricity generation from gas declined by 22% to 5.846 terawatt-hours (TWh) in May, to account for 25% of Turkey’s overall power production. In contrast the amount of power produced from coal increased by 56% to 4.54 TWh while that from lignite increased by 37% to 3.81 TWh. That meant coal’s share of total Turkish power production reached 20% while lignite’s reached 16.4%. The energy ministry over the past two years has increased efforts to reduce dependence on imported gas by building power plants that run on domestic coal and renewables, whilst also continuing to invest in new LNG terminals, and new pipelines to import gas from Azerbaijan (Tanap) and Russia (TurkStream). It's believed Turkey wants to generate more baseload power from coal, but keep the option to use gas to meet generation for peak demand periods; its 'Vision 2023' policy last year aims to boost renewables' share in the electricity mix by then to 30%, raise coal to 30%, raise nuclear to 10%, and reduce gas to 30%. However not all recent monthly statistics have shown a decline in Turkish gas imports. In terms of how Turkey received its May gas supply, piped gas imports were down 27% year on year at 2.454bn m3 , while LNG imports increased by 20% to 0.554bn m3. Domestic production in Turkey is tiny. During the five months to May 2018, Turkey’s overall gas imports declined by 5% year on year to a little more than 23bn m3, despite LNG’s share of that increasing by 21% to 5.73bn m3. Qatar increased its deliveries by a factor of 4.7 times to account for 30% of Turkey’s five-month LNG intake. Turkey also exported 238.44mn m3 of piped gas to Greece in the same period, 13% more year-on-year.